We provide a variety of services for both the residential and commercial sectors. No Job is too small or too large for our company. We take on projects ranging from kitchen remodeling too full high rise installations. Our team is experienced, and no other contractors can beat our prices. We specialize in serving the needs of home builders and construction companies by offering reasonable and reliable lead times and scheduling in order to help our builders cut costs. We can tailor fit a more cost effective approach to the specific way that you build in order to cut more costs. We utilize an advanced procuction system incorporating innovative technology to produce superior quality in every job. 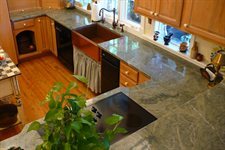 At Houston Granite and Tile, quality, customer service, and satifaction is our #1 goal! No two tile installation jobs are the same, but every Houston Granite & Flooring job bears the signature quality craftsmanship Houston' homebuilders and contractors trust. Our dedicated team takes great pride in handling tile installation for projects ranging from new residential and custom homes to high-rise condominiums to retail centers, office buildings, restaurants, hotels and more. We look forward to taking your job from concept to completion. Whether you are in the market for a new hardwood floor installation or would like information on the sanding and refinishing of an existing floor, our experienced and knowledgeable professionals are ready to work with you to beautify your home, office or place of business. Anything from classic red oak and Brazilian cherry, to environmentally-friendly woods like cork and bamboo. Prefinished wood gives you the look of solid wood, but doesnt need to be sanded or finished. Plus, it can be refinished at least twice when that time comes down the road. Dogs and kids? No problem. Laminate floors are made from synthetic materials, usually melamine resin, and are virtually scratch-proof. The durability of laminate floors like Pergo has earned them increased popularity in busy households. Nothing completes the look of a well decorated room like a classy carpet. With access to virtually any specification of carpet and our own exclusive range of patterns and colourways, we can provide the right solution to any project that demands an aesthetically-pleasing, hard-wearing, stain and fade resistant contract carpet. When you allow Houston Granite and Flooring to become a part of your remodeling experience know that you are hiring professionals, with true expertise and dedication to service. We are ready to make your home improvement dreams become a reality! A soothing master bath retreat is like having your own private spa just a few steps away. Amenities such as a marble tile tub and a spacious, soothing shower accented by special windows and an elegant chandelier take the stress out of preparing for your day, or an evening on the town. We can help you choose just that custom touch to make you feel pampered - like taking a vacation and never leaving home!